The Kensington range of wooden gates are beautifully crafted from smooth planed Scandinavian Redwood that has been pressure treated for a long life. 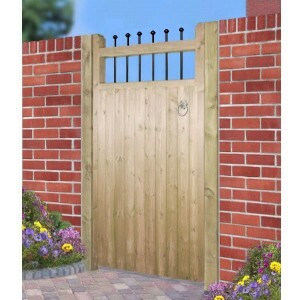 The thick frames and rear bracing has mortice and tenon joints whilst the front is clad with tongue and groove boards, giving a strong, substantial gate with a quality finish. The Kensington gates incorporate a row of metal bars topped with ball finials that give the gates a stately appearance and provide additional security without the use of spears tops. 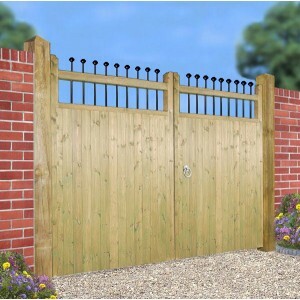 The Kensington Double Gates are a beautifully crafted pair of gates with a combination of wood and m.. The Kensington Estate Gates are a beautifully crafted pair of tall double gates with a combination o.. 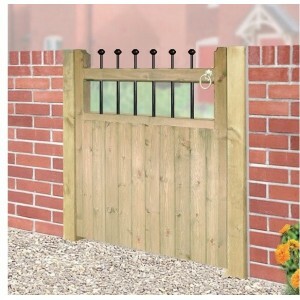 The Kensington Single Gate is a beautifully crafted gate that combines wood and metal to create.. 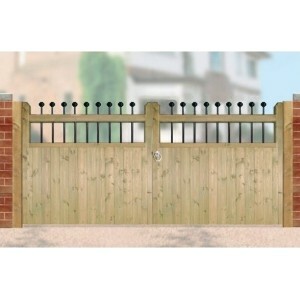 The Kensington Tall Single Gate is a beautifully crafted gate that combines wood and metal to c..